Polyarc Games‘ new release, Moss, is an action adventure puzzle platformer about a small mouse finding herself in a big adventure aided by a ghostly spirit being called “The Reader.” The player takes on the role of this Reader to interact with the environment, but also controls the mouse, Quill, as she traverses the areas and battles clockwork robot bugs. All over the Internet right now, you can’t throw an acorn without hitting a positive review of this charming game. What I find so enthralling about Moss is that it is a departure from what we’ve come to expect in a VR game and yet if feels very familiar in a rather unexpected way. While most VR games have leaned towards first person experiences with shooters, the Skyrim port, and a few vehicle driving type approaches, Moss puts the player in the role of an observer with relatively minimal direct action upon the enemies so much as the world itself. Quill is the adventurer in this tale, you are her guardian spirit. The player can move things around like statues and blocks or they can take control of enemies to make them stand still, hold them in place while bringing Quill in to attack, or make the enemies fire their weapons at puzzle switches or other enemies. Here I’m controlling the light blue enemy to shoot the red ones while Quill hangs out safe up top. Where things feel familiar for me is the sets designed for each level. Something about them feels like stepping back into childhood of the 80s and early 90s where practical sets and models were used rather than CG effects. Despite being a video game, the areas that Quill explores feel like physical models that you’re allowed to look at due to the nature of VR. Tilting your head to look into a building Quill is going into or raising up and leaning forward to look down at the set to see what’s hidden behind walls and into nooks and crannies really gives a sense of being there rather than merely observing the location. That feeling of familiarity has been mentioned in a few other reviews as something out of a Jim Henson film with the charm of a Studio Ghibli production, but it reminded me of the Neighborhood of Make-Believe from Mr. Rogers Neighborhood. Only in this case, it’s more like Mr. Rogers’ World of Make-Believe as designed by J. R. R. Tolkien (or perhaps more accurately, Brian Jacques). All of this combines to feel like you really are looking at the scenes of a storybook, which is exactly what you, The Reader, are doing in a sense. You can just barely see Quill between the center pillars! On the topic of familiarity, and since I mentioned Brian Jacques, fans of the Redwall series will surely feel there are some similarities and possibly influential inspiration here. When Moss was first shown, I thought it might have somehow been connected to the series of books, but it’s not. Moss is its own storybook and Quill her own character, and what a character she is. The game begins with the player sitting in a large church-like library. Rows and rows of tables extend before you with a few having stacks of thick tomes on them, but only yours has candles before it with a book set before you to read. The book is titled Moss and your first interaction with the world is to open it. The narrator, who voices all characters in the game much as other indie titles have done splendidly, begins by telling the story of how the Mouse Kingdom fell to a great evil and how their people narrowly escaped with the help of a warrior. That warrior’s wounds proved too great and he died in the forest, a tree growing upon him and holding a powerful artifact, a Glass, within it. The story is told in small bits, each related to a page in the book which dims when that narration is completed, indicating it’s ready for you to turn the page until the story moves to the current level in the tale. Quill lives with her uncle and although he warns her about staying out late, she tends to push just a little further in her explorations of the forest beyond their town. We first meet her coming back from an expedition of exploration shortly after the previously mentioned Glass has fallen from the tree. Quill stops to check her pack where she seems to have found a button, though she drops it when she’s startled by a crow and hides in a small hole at the base of a large tree. As she starts to leave, the Glass glows and chimes and she picks it up, putting that in her pack instead of the button. Then, she notices the player. Looking up at you, she’s startled, but then calms and comes closer, moving to a little pier and her gaze practically invites you to lean down to look closer at her. In doing so, the Reader’s reflection is seen in the water and you do definitely look like something from a Ghibli film. From there, Quill hears the bells and heads home before the gates close. That’s you in the back there. The game uses the few areas between the start and getting Quill home to get familiar with the controls, which aren’t too difficult. The most challenging aspect is adjusting to combat later where you’ll want to use the motion controller to move in a 3D space while simultaneously keeping an eye on where you’ve got Quill moving so she’s able to fight. Combat isn’t particularly difficult, but there are a few fights where things get a little hectic trying to control Quill and grab enemies to delay them from getting her. Most of this difficulty for me seemed to be getting my Dualshock 4 out of the PS4 Camera’s field of vision mid-combat. Over the course of the game, Quill doesn’t gain new abilities or power ups. What she starts with is what you get, other than a story upgrade that doesn’t translate to in-game power. That’s fine though, because what you start with is an adorably charming mouse who is intelligent and expressive. In my first playthrough of the game, the biggest mistake I made was identifying how to solve puzzles and executing that strategy. 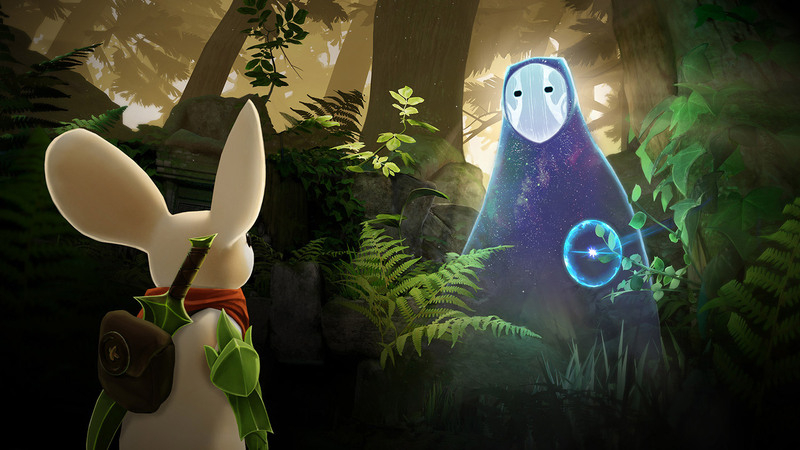 Not solving puzzles immediately offers you the chance to watch Quill give you a hint with simplified sign language and pantomime with smooth animations. It’s fun to just watch her sometimes. The Reader can even interact with Quill by holding the button to grab things while hovering over her, allowing the player to give her a little pet to the head, ears, back, or belly. She often reacts positively to this, much like a real pet, though later in the game she finds it annoying in a “now is not the time for petting, this is serious” sort of way. Here I’m giving Quill an anime-worthy head pat. Moss is a fun little game that I enjoyed every minute of. I played straight through from start to finish, logging about 4 hours in total. Some might find this a bit too short for the $30 price tag, but I am more than content with the experience. It’s one that’s enjoyable enough that I find myself wanting to play through it again (which I’m going to do to get platinum if nothing else). The most telling of the game’s affect is that I find myself not only wanting to replay it, but wanting more. Minor non-spoiler: The game ends with a clear indication this is just the beginning of Quill’s tale and that her adventures with the Reader have only just begun. Since the game starts with the player in a library or cathedral reading the book, Moss, I’m curious if the mystical ghost-like Reader in the tale is the reader of the book, able to interact with the story itself or if the literal reader and the mystical Reader are separate entities. Perhaps it’s a question that doesn’t need answering, but it does seem like an interesting one. I’m curious to know more about Quill’s sword and her arm guard, the mystical Glass artifacts. I want to know more about the evil that rose under their kingdom so long ago. I want to know more about the humans that clearly existed in these lands ages ago. I want a Moss animated series. Most of all, I want one of those adorable Quill figures Polyarc Games has given away with hide & seek games at various conventions and now through various partners and YouTube channels with the game’s release. Seriously, Polyarc Games, let me give you money. I want to help fund another adventure with our little mouse friend.